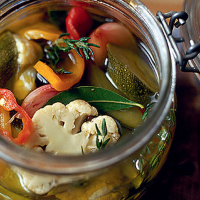 Lightly pickling vegetables and dousing them with olive oil produces beautiful mixed antipasti. Use them in a relaxed but superior starter: drape cured ham, rocket, olives, young Pecorino shards and griddled sourdough across a wooden board and accompany with a bowlful of the pickled vegetables. Bring the vinegar to the boil in a large saucepan with 1 litre cold water, the salt and sugar. Add all the remaining ingredients except the olive oil and simmer for 5 minutes. Strain the vegetables and discard the pickling liquid. Divide the mixture between the jars and cover with the olive oil. Screw the lids on tightly and leave to cool. Keep the sealed jars in the fridge for up to 4 weeks; once opened, use within a week.